Take 3 bowls, in the first bowl mix together the flour and cayenne pepper, in the second bowl mix together the eggs and tomato salsa and in the third bowl mix together the finely crushed nachos and oregano. Take each butterflied chicken breast and coat it first in the flour mix, then the egg mix and finally the nachos, repeat this with all of the chicken breasts. Cover and refrigerate for at least 20 minutes. Pre heat the Evolve or 360 grill with the deep pan plate attached. Put 3 chicken breasts in the deep pan, close the lid and cook for 5-6 minutes, turn over and cook for a further 6-8 minutes until cooked through and the juices run clear. 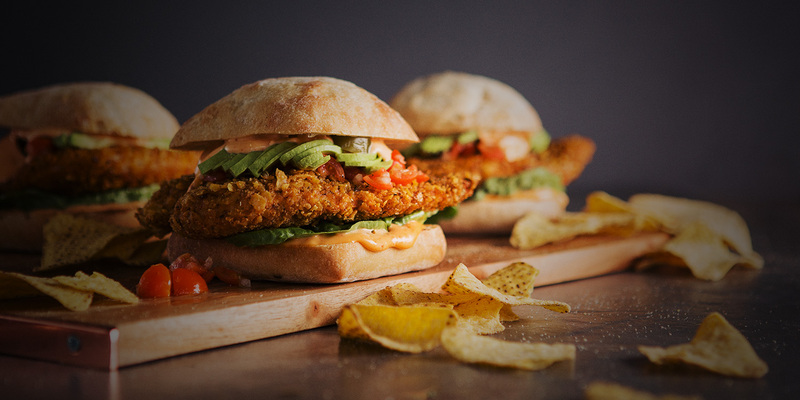 To serve: serve on a ciabatta bun with tomato salsa, sliced avocado, red onion, spicy mayo and jalapenos.